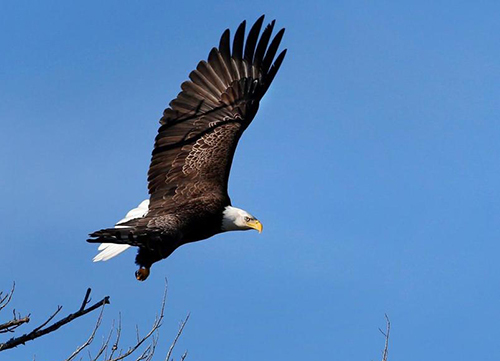 Bald eagles are in the midst of record population growth in the northern New England states, where they could find themselves removed from all state endangered lists. Bald eagles are in the midst of record population growth in northern New England, where America's national bird could soon find itself removed from all state endangered lists. Wildlife officials attributed the bird's comeback to habitat and environmental protection measures, such as the ban on the pesticide DDT, a change that made it easier for birds of prey like eagles to reproduce successfully. The bald eagles' comeback in northern New England tracks in line with their population growth elsewhere in North America. Bird counters who participated in the Audubon Society's annual Christmas bird count were lucky to find 10,000 bald eagles in the U.S. and Canada in the 1980s, according to data collected by the organization. Now the counters routinely find more than 40,000. "It's going faster than most people thought it would, the recovery," said Margaret Fowle, a conservation biologist with Audubon Vermont. "There's been a consistent upward trend." The birds have come back so strong in Maine that they sometimes pose a threat to birds such as the great cormorant, which is a seabird on a state protected list, said Doug Hitchcox, a staff naturalist with Maine Audubon. Eagles sometimes prey on the cormorants' young, which presents a difficult balancing act for conservationists who want to see both species protected, he said. "I want to hold up that banner and say look at the success story, but in a greater ecological perspective, we're not done telling that story yet," Hitchcox said.